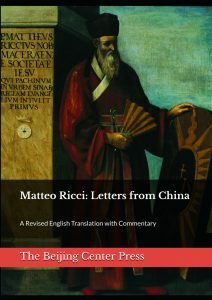 Matteo Ricci: Letters from China (2019), new and expanded in English translation, presents a selection of Ricci’s letters and original essays by leading experts who examine the significance of Ricci’s thought for our time. The letters of Matteo Ricci (1552-1610) provide insight into the thinking and experience of this highly regarded Jesuit scholar and missionary. Reading Ricci one marvels how his deep understanding and experience of China can still speak to us today. Ricci’s letters enrich our knowledge about China, cross-cultural dialogue, friendship, and can serve as a guide in meeting the opportunities and challenges of East and West relations today. Available now on Amazon.com here. Edited by: Brendan Gottschall, S.J., Francis T. Hannafey, S.J., Simon G. M. Koo, and Gianni Criveller. Please note the links to Amazon.com are Amazon Associate links. The Beijing Center is a participant in the Amazon Services LLC Associates Program, an affiliate advertising program designed to provide a means for sites to earn advertising fees by advertising and linking to Amazon.com. Any fees earned by purchases made from the textbook links provided on this page will go towards The Beijing Center’s Library Fund to support The Anton Library.